May 30, 2013 by Verle L. Bell, M.D. As I watch others’ behavior and evaluate whether they’ve done well or not, I need to work at balance by finding all that is good. The negative comes easily. I can do this especially by putting a positive spin on their actions and finding a word from the following list to bestow on them. This is what it really means to bless them that curse me! 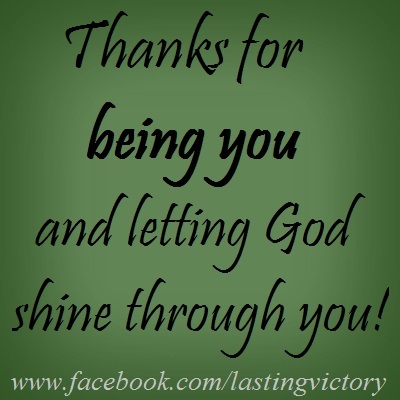 THANKS FOR BEING YOU AND LETTING GOD SHINE THROUGH YOU! Philippians 4,8 Finally brethren, whatsoever things are positive- focus on these, especially the things others do. Sure God is delighted when I delight in the wisdom and wonder of his words but the one thing he loves most and has paid the biggest price for is his people, his masterworks. He really likes me to use my mind, eyes , ears and mouth to build up his people. Can any good originate from the devil? No, when we see good in others we are worshiping the wonder of God’s nature and character leaking through even very flawed vessels. When the wicked high priest said that it was better for one man to die than for the people to perish. The Holy Spirit was talking through him! When Shimei cursed king David, David saw God testing him through this. I might fear that, if I am too positive, then others will never see their flaws and never change. I have found that when I faithfully suppress my natural desire to find fault and look for and voice positives, that others strive to live up to the new vision of God in them. Then if I have to voice some legitimate concern, they are more likely to listen. But does this require me to lie? No, No, just to humbly admit that there is a lot more positive in others than my stingy mind has cared to admit. I had a friend in a Baptist children’s home who practiced the picky positives by writing down, the positives he’d noticed the children do, on sticky notes and putting them on the children’s pillows. Not once did any of them say thanks! He was discouraged and thinking of stopping until he noticed a couple of them, who were being discharged, packing wads of the notes into their suitcases. Those notes had been part of what had helped them grow to the point of being ready for discharge. Probably the hardest application of this truth is to look be picky positive about what God is doing in and through me allowing his character to shine through. LORD LET MY LIGHT SO SHINE THAT PEOPLE SEE YOU AND GIVE YOU GLORY ESPECIALLY AS I PRACTICE BECOMING AN ENCOURAGER. This entry was posted in Uncategorized and tagged ATTITUDES of peace and power, be positive, character, encourager, HOW TO: outlines on godly living, Relationships, WEAPONS OF WARFARE. Bookmark the permalink. Thanks for the encouragement. I’m new to blogging and have to remind myself to click spellcheck let alone adding key words. Is there a way to find out which words are the most popular? I tweeted this! Thank you for ENCOURAGING me to be an encourager. I hope I remember to try using sticky notes to praise our son. What a wonderful idea!